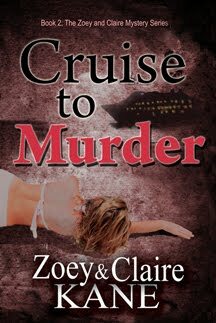 I am happy to be one of the first few stops on The Cruise to Murder blog tour. Thank you to Molly Snow for organizing the tour and to Zoey and Claire for the review copies, guest post and ebook giveaway (both novellas) for one winner! Be sure to stop by Zoey and Claire's blog to check out the other stops on the tour. More guests started to arrive to the stage party. Larry had a few of his magician’s equipment lined against one side. Soon, there was standing room only. That left Butch looking at Zo and Zo looking at Butch. They knew what was coming next. “Ask me,” Zo said. Without a moment longer, Butch had her twirled around him like a helicopter’s propeller. He let go of her and she unwound round and round, sliding across the floor with the lean of the ship—toward Larry’s large black, disappearing trick cabinet. Zo made contact. Thud! Clank. Clunk. The handle was knocked and the door flew open. A woman leaped out of the cabinet, flinging her arms around Zo’s shoulders. People gasped and screamed out. Zo grabbed the woman by an arm, flipped her over and pressed her against the stage floor. Claire: I love this scene. It shows how unpredictable our adventures can be. It also displays Mom’s swift reactions to terror. She has a lot more guts than I do at times, and I don’t totally understand where she gets it. Zoey: I rely on my daughter’s keen, cool thinking, which keeps us heading down the straightest, safest course. Her weapon is her cell phone. While our stories seem at times somewhat over-the-top, they could happen. And if we didn’t have the strength to confront dead people, the bizarre, or hideous bad guys, then we wouldn’t be able to follow through with our adventures and solve the mysteries we fall into. Instead, we would be screaming, running away, sitting in front of the TV, watching someone else’s adventure. Blurb: Zoey is known around her town of Riverside for making bad decisions when it comes to auctions and real estate investments. When her savvy daughter, Claire, learns her most recent purchase is eighty acres on the haunted, desolate side of town, she is simply flabbergasted. This purchase soon reveals some hidden inconveniences, like—murder, skeletons, secrets, and the riddles of Hillgate Manor. Claire: "Maybe that's why The Fillmores abandoned it in such haste. Maybe that's why it was a secret for so long and all these crazy things have happened." Zoey: "I know. But don't worry, darling, we are safe for tonight at least." Claire: "Mom, I have never heard you so sure of yourselt." Zoey: "Well, having a colt .45 under my bed can do wonders." 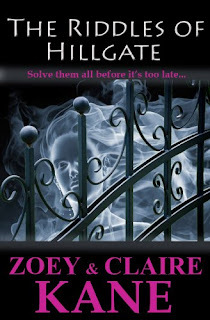 My thoughts: The Riddles of Hillgate is the first book in the Zoey and Claire Mystery Series. I do not really want to give a summary, because this book is too short and I do not want to let the cat out of the bag. The beginning of this novella is something less than spectacular and it seemed to be a bore. It is anything but boring, even though there are some ups and downs. When the murder is overwhelmed it seemed to be the end of the story, but the story still goes on. To be honest it costed me quite an effort to continue reading at this point, because what should be happening yet?! Well, you might be surprised what happen next! Zoey and Claire are an amazing team. Zoey reminds me a bit of a Brtitsh upper-class lady. It's difficult to explain in detail, but it might be her character, her appearance, the marked preference for antique objects, her light-heartedness and her optimism to transform an abandoned estate into a glamorous one. And of course her quite deadpan humour - I loved it! But do not let Claire out of consideration. She is an exceptionally character too. All in all I want to say: Read this mind candy book and have a lot of fun with The Riddles of Hillgate. Blurb: Zoey and her daughter Claire are bon voyage on an elite celebrity cruiseline. Little do they know they will run into Claire's publishing idol, billionaire Felix Belmont, and that trouble is following him on the seas. When they disembark at Kinikiwiki Island, this mother-daughter-duo get tangled up in voodoo, murders and an international conspiracy. Will they solve the mystery before their own lives are at stake? My thoughts: The first book in the Zoey and Claire Mysteries series was quiet good and I hoped the same for the second. I am very happy to had the chance to read this novella too. Thanks to the authors and publisher. The second book in the series do leave no doubt about its entertainment. It was amazing. "You two are murder magnets and yet so sweetly enticing, so thrilling and heart pounding, filled with scary adventure. It is terrifyingly interesting to be around you two." The story is quiet fascinating with an more ambitious content than the first novel and it affords lots of surprises. I was perfectly wonderful entertained! Take my advice and read this series. You will not regret, I promise! Win a copy of the first two books in the Zoey and Claire Mysteries Series! This giveaway is open to all and ends on March 25th 2012! One entry per person only! Multiple entries will be disqualified! The winner will be announced on my blog and also be contacted via email by the publisher. (you agree me to give your email-address to the publisher!) The email will include detailed information to claim your prize! The winner must complete the form to supply his full name and postal address, if necessary. If all your information is not completed, we will automatically pick a new winner!